More than 250 people are still missing as firefighters shuffle through kilometers of thick mud looking for survivors. RIO DE JANEIRO, BRAZIL – In the early hours of Sunday, warning sirens were once again issued by mining giant Vale around the town of Brumadinho, Minas Gerais, alerting residents to move to higher ground. The alert was given less than 24 hours after a dam broke killing at least 37 people. Firefighters look for survivors in Brumadinho where on Friday a dam broke, burying part of the town under mud, photo internet reproduction. 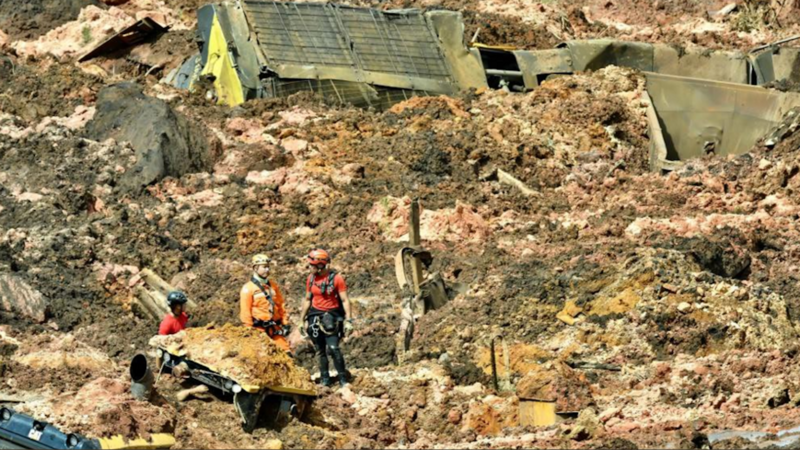 “Vale reports that at around 5:30 AM on Sunday, it triggered warning sirens in the region of the Feijão Mine in Brumadinho (MG), due to the detection of increased water levels in the instruments that monitor the VI dam,” read a Vale statement. The dam in question holds over 1000 cubic meters of water. After the warning sirens, Brumadinho was closed off and residents in the lower part of the city have been relocated to the higher parts of the town. Officials say more than 250 people are still missing. Firefighters shuffled through kilometers of thick mud to look for survivors all day Saturday, finding over eighty survivors. The dam, which broke on Friday a little after noon, leveled the mining company’s administrative office and the restaurant, where hundreds of employees were believed to be having lunch. On Saturday afternoon a bus full of Vale employees was found underneath meters of mud. All those inside the bus did not survive. Vale released on Saturday night a list of more than 250 names of employees whom they were unable to contact. In addition to these employees, officials say that there may be other possible victims among those who were in houses near the dam and in a hotel in the region. Overwhelmed with the extent of the disaster, Brazil has accepted Israel’s offer to help look for victims. On Sunday night an Israeli airplane carrying 130 men and women and sixteen tons of equipment able to detect bodies underneath the earth will arrive in the country.